How Kitchen Raids In Buffalo Sent Shock Waves Through Immigrant Rights Community Federal immigration agents raided four Mexican restaurants in Buffalo, N.Y., recently — one of largest worksite actions in recent years. Outraged locals are asking: Why pick on taco cooks? Sergio Mucino was charged with harboring unauthorized immigrants after U.S. Immigration and Customs Enforcement raided his four Buffalo, N.Y., restaurants, but critics say his illegal workers have suffered much more than he has. The morning of Oct. 18, 2016, the employees at La Divina, a taqueria and Mexican grocery in Buffalo, N.Y., were prepping for the lunch crowd — making salsa, grilling chicken and stocking the shelves with Mexican Cokes and Corona beer. Suddenly, agents from Homeland Security Investigations rushed in. "I heard someone shouting, 'Don't move! Don't move!' 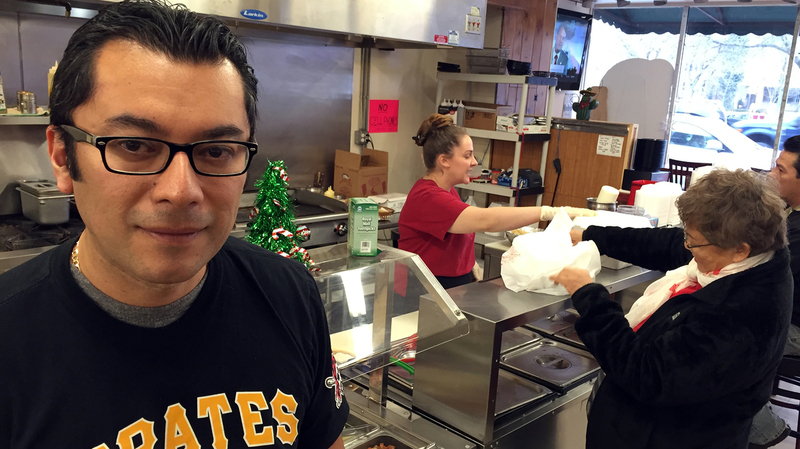 It was ICE," says Jose Antonio Ramos, a 29-year-old Mexican cook working illegally, in Spanish. ICE stands for U.S. Immigration and Customs Enforcement. "I was in shock. I was complying with their orders, but they were mistreating us," he says. "They pointed guns at our heads. They pushed us on the floor and handcuffed us. They brought in dogs." Beefy federal agents hauled out computers and cash registers while local news crews filmed. The raid of La Divina and three other restaurants under the same owner became one of the nation's biggest immigration worksite actions in recent years. In all, 14 workers have been charged with civil and criminal immigration violations. Twelve more workers were found to be in the country illegally, but they were released because they didn't meet the government's enforcement priorities. The owner and his two managers are charged with harboring unauthorized immigrants. The federal criminal complaint alleges the trio provided workers with housing and transportation, paid them in cash off the books and avoided income taxes. Sergio Mucino, a 42-year-old lawful permanent resident from Mexico City, owns the four restaurants ICE raided. During a recent lunch rush, Mucino is spotted making tacos behind the counter at La Divina with some newly hired workers. He declines to discuss the raid because his case is ongoing, but he is happy to talk about his menu. "We try to offer authentic street tacos, make it more like a Mexican atmosphere," he says as patrons line up to order ribeye and chorizo tacos. While Mucino is out on bail and reopening his restaurants one by one, most of his illegal workforce is out of a job and facing deportation. This was the aftermath of the raid despite an ICE statement that they were targeting the abusive employer, not his employees. Over at a lunch counter, Jeff Dugan, who works at a local marketing company, digs into a plate of chicken quesadillas. Dugan says he supports the ICE raid. "I want the workers to be in good standing and ... working under our laws and [well] taken care of," he says, "because when they're not, they get put in subpar housing and they're getting underpaid and overworked." Thirteen hours a day, six days a week are what Ramos and his coworkers put in. They earned the equivalent of $6.50 an hour — below the federal minimum wage. "I guess my only complaint would be the long hours," Ramos says. "But you need to make money to eat and take care of your family. You have no choice." The father of three children from San Luis Potosi, Mexico, wears an electronic ankle monitor and faces a civil violation for overstaying a work visa at a different restaurant that paid him even less. The city has rallied around the Buffalo restaurant workers who are facing removal. Churches are supporting them with food and rent assistance while they await their immigration hearings. Local sympathizers have demonstrated outside the ICE office in this Northern border city and circulated a petition asking federal authorities to let the workers go. An ICE spokesman defends the raid. He says they focused on Mucino, but during the course of the investigation they learned some of his workers had re-entered the country after being deported, which is a felony. But some locals are asking if these relatively minor violations are a reason for federal agents to storm restaurant kitchens with handguns drawn and police dogs. "It's really small potatoes and so it really did shock this community," says Nicole Hallett, an immigration law professor at the University of Buffalo. She represents four of the workers. "I think it did shock the national immigration rights community." Most immigration offenses are civil, not criminal, but there are exceptions. "Criminal re-entry" is the charge when someone is previously deported or removed from the U.S. and comes back. Unauthorized immigrants who are deported often turn right around and make multiple attempts to re-enter U.S. territory. 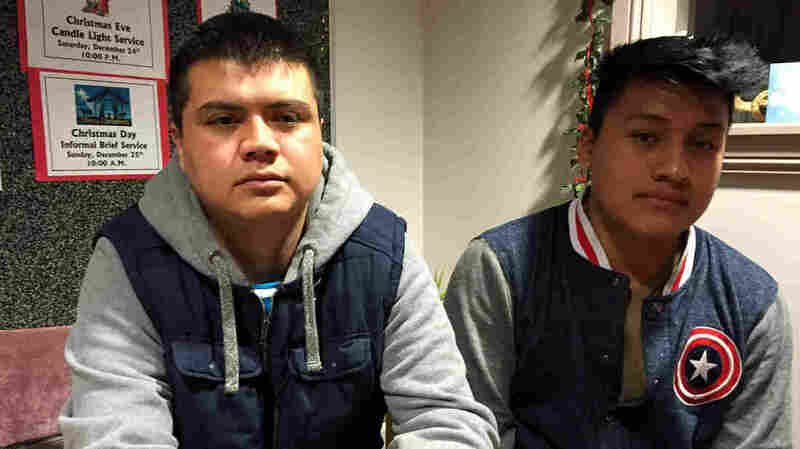 During one of the biggest immigration raids in recent years, ICE officers arrested Jose Antonio Ramos, 29 (left), a cook at a taco eatery and grocery store called La Divina, and Sergio Medellin, 19, a sous chef at Agave Mexican restaurant. They are facing deportation. "But most of the time when someone gets charged with criminal re-entry it's because they have other criminal history," says Hallett, puzzled. "So [federal prosecutors] very rarely will indict someone with criminal re-entry if that is the only thing that they have." That's what happened in Buffalo. Big, headline-grabbing worksite sweeps were common under President George W. Bush. President Obama has mostly taken a more low-key approach, such as auditing employer records to make sure all the workers have valid Social Security numbers. "You need it all. You need audits, but you need an enforcement action now and again," says a top ICE official in Washington, who asked not to be named. "We're trying to send that chilling effect to employers [to say] you need to think twice" about exploiting illegal workers. Yet Hallett says these raids can easily backfire. "If one of your goals is to protect workers from exploitation, obviously arresting those workers as part of an enforcement action makes workers very afraid to come forward and report if there is exploitation happening," she says. Obama's Homeland Security team will be gone soon and there will be a new sheriff in town. President-elect Trump and his advisers have talked about cracking down on unauthorized immigrants and the job magnets that attract them. It's reasonable to ask if, under Trump, the Buffalo restaurant raid will become the norm rather than the exception.